Fog lights are one of the first things people buy after coming home from the dealer with their brand new vehicle. Foglights are SERIOUSLY overpriced when purchased as an OEM factory option, thus many smart buyers visit our website to buy and install their own Fog Light Kits at a fraction of the cost. 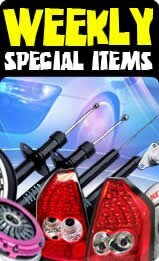 Also, here at Tunersdepot.com, we try to offer a wide selection of the newest and best styles of fog light kits for your vehicles. 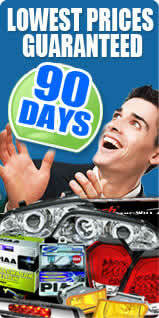 This is the first choice you will have to make for your vehicle's fog lights. Please note that product line is growing all the time, so if you don't see the exact type of foglight kit you want, please check back often as we get new styles of foglights all the time. The OEM fog light kit is designed to be a replica of the factory fog lights. The lens and basic shape is the same. The only difference might be in lens color, which outside of the standard clear, may be offered in yellow or smoke (more on that later). If you have a set of stock fog lights that are old or damaged, then our OEM Fog Light kit is probably a good idea since they look roughly the same and install the exact same way as the originals. If you are looking for something a little different and more personalized, then a set of our Halo Projector Foglights might work best for you. Halo Projector Fog lights are the same size as stock Fog Light kits, but they use a completely different type of lens. By incorporating a convex lens to "project" the light from your foglights, they transfer the shape of your light beam to be spread over a wider area. This increases overall visible viewing area, making your vehicle safer to drive during foggy conditions. Also, our Halo Projector fog light kits use halo lighting technology (also known as angel eye lighting) to provide even more light from the foglight. By adding an extra illuminated ring around the projector (the "halo"), they give your fog lights the same glowing ring look as the higher end European headlights. Also, for certain applications, the halo is left unwired, giving you the option to splice them into your vehicle's parking lights, allowing you to turn only the halo ring on when you activate your parking lights. Alternatively, you could not wire them all if are expecting a more low key look from your stock fog lights. There are not many "name brand" aftermarket fog light kits out there. Most people don't even notice a brand unless they are actually picking up a set from the automotive dealer. For the most part, the different brands look relatively alike, but there is a few differences. X3 is a great brand. X3 is also an affordable brand. That's why we offer so many of their products on our site. They offer a decent selection, are fairly reliable, and are a great choice if you aren't too picky and just want a set of foglights on your mustang as cheap as possible. Not all X3 Mustang Fog Light Kits (both OEM and Projector Halo Style) come with wire harnesses and fog light switches though, so additional parts might be required. though buying your fog light switch from the dealer usually ends up with the dashboard of your vehicle looking a lot better anyway. Winjet is about as close as their Foglights get to having a "name brand." The quality is a bit better, and they usually install easier as well. Also, unlike the X3 Fog Light Kits, every Winjet Fog Light Kit comes with wiring harness and fog light switch (universal style in some cases), even for models where the vehicle should already have them pre-installed. This makes Winjet a perfect choice for people looking to make a clean installation on their vehicle that have harnesses that might be missing or damaged. Our 77 Fog Lights (Vehicle Specific) Reviews have an average rating of 4.7 out of 5 stars. Every customer can leave a review about our service and the product that was purchased. In order to leave your review for the purchased product, please log into MY ACCOUNT after you receive your order. We encourage all of our customers to take the time to share their experiences with our website with everyone. Quality appears good, fitment good, and 90% plug in play for car with stock OEM fog lamps. Did require the swapping of OEM lamp wiring, bulb, and rear lamp housing cover. But once done, 1 hr later, new lamps fully installed. Easy to adjust, look great, and better than worn out OEM fog lamps.